Video posts that we have sourced on Hurricane Gonzalo as it approached and hit Bermuda can be seen here: https://www.islandrealestate.com/news/. Most news reports from off and on Bermuda estimate that 90+% of the island might be without power. Today, the day after the storm, will involve a period assessment and review as part of the clean-up process. As new updates are available we will post them or in our news section. If you have images you would like to share we would be glad to hear from you. Picture of Horseshoe Bay Beach, one of the island’s most famous attractions for tourists and locals Bermuda Real Estate for Sale Bermuda Real Estate Rentals “You go to heaven if you want, I’ll stay in Bermuda” These are the words written by famous author, Mark Twain after his visit to this special island in the late 19th century. Blessed with a temperate climate and magnificent pink sand beaches, Bermuda sits like a tiny atoll in the north-Atlantic, 950 miles north of the Caribbean islands of the Bahamas and 650 miles due east of North Carolina. Bermuda is officially known as The Bermuda Islands and is an overseas territory of the United Kingdom. With beaches galore and an interesting history, it is a popular holiday destination, as well as a smart yet restricted choice for island real estate investment. Bermuda’s rich culture and history can be much appreciated by exploring the island. In spite of its small size, the Bermuda islands have an almost unending list of visitor attractions and caters to all tastes. The economy of the islands of Bermuda is based on tourism and international business and boasts one of the highest per capita incomes in the world. Tourism is a substantial contributor, with 400,000 people vacationing annually in Bermuda. Real Estate investment is popular here, due to the close proximity to the United States. The Bermuda dollar is on par with the American dollar. Financial services account for 60% of the GDP. 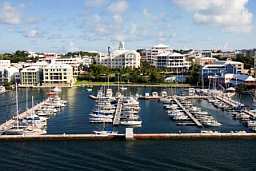 Image of a Bermuda property overlooking the waters of Hamilton Harbour with a gew local boats in view Bermuda has a stable and intelligently run economy, and a sophisticated infrastructure. From the earliest Victorian era until recently, the economy was led by tourism. However, it has now shifted to the high-tech international businesses. Successful and fast economic growth, coupled with local investment has resulted in the increase of wealth through Bermuda real estate holdings. Today, the Bermuda real estate market continues to offer exciting opportunities, although demand has driven prices up in the recent years. Bermuda island real estate investors will find that property sales to foreign purchasers are regulated by the Government to protect the balance of foreign ownership on the island. Whether you are an island real estate investor, part-time resident, or simply an adventurous vacationer, the north-atlantic Island of Bermuda will cast her spell on you! Bermuda is a popular holiday destination. People flock here from far and wide to laze on the beaches, play at the eight public and private golf courses or go sailing or swimming in the sparkling blue waters of the Atlantic Ocean. Bermuda offers a wide choice of activities, ranging from boating to bowling, bird watching and fishing to golfing and horseback riding. Exploring the island on a pedal cycle or playing squash at clubs are just some of the activities available. Bermuda has some great attractions, outdoors and indoors, underwater and underground! The Maritime Museum, The Bermuda National Trust and Bermuda Historical Society provide a glimpse into Bermuda’s history, while Dolphin Quest, Snorkel Park and the Rock Climbing and Underground Cave Exploration packages are available for adventurous types. The islands of Bermuda possess a number of restaurants, from the expensive and elegant, to the casual and less expensive and from the gourmet to the simple home-style restaurants that serve English pub fare and international cuisine. Entertainment in Bermuda is also varied and available in abundance. From dinner for two on the moonlit beaches to beach parties and dancing to the latest R&B, everything is available here. You may choose to hang out at one of the local pubs or the exclusive Jazz and Art galleries, followed by a sunset sail. In summer months, soca and reggae fans can enjoy late night jam sessions on the pristine beaches of Bermuda. In the autumn, music and drama festivals attract R&B singers, jazz musicians and dance troupes and performers. With Bermuda located north of the Caribbean Islands it possesses remarkably mild sub-tropical weather that seldom witnesses extremes of heat or cold. During the summer months, Bermuda is quite warm and humid, with temperatures rising to 90°F in August. 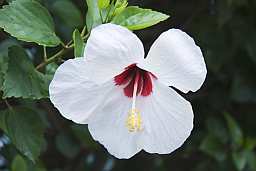 However, the island is almost constantly fanned by a cool sea breeze. Between May and October, the average temperature is around 75° to 85°F and in the winter months, the average is between 60° and 70°F. It never snows here and the rainfall is spread evenly throughout the year, at an average of 4 inches a month. There are occasional hurricanes during the summer months between June and November. 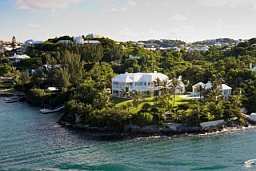 Formerly known as the Islands of Bermuda, it is actually a string of about 130 tiny islands. It is the second most remote island cluster in the world and is located not in the Caribbean, but in the North Atlantic Ocean. Its coordinates are 32’ 20” N and 64’ 45” W and the nearest land is to the west, Cape Hatteras, in North Carolina, which is about 650 miles away. Bermuda is 950 miles north of Nassau, Bahamas and New York City is some 750 miles northwest, while London is about 3,460 miles northeast from here. Bermuda is a cluster of over 130 islands laid out in a sort of rough east to west axis. The main islands are connected via road bridges and most of the islands have low hills and fertile valleys. Getting to Bermuda is easier and much more convenient than most people imagine, which is why owning Bermuda real estate is a very attractive but controlled option. Bermuda International Airport is in St. George’s Parish, near the Castle Harbor. There are daily flights from the USA and the UK and weekly flights from many other European nations. Bermuda is accessible via direct flights from London, Boston, New York, Toronto, Chicago, Philadelphia and Baltimore, as well as Washington, Orlando, Atlanta, Charlotte and Fort Lauderdale. 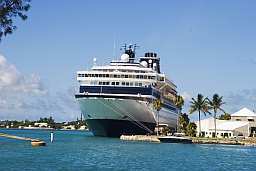 Bermuda also has regular cruise ships that dock at Hamilton, Saint George’s or The Dockyard near Somerset and is a popular destination for yachts and other smaller oceangoing vessels. In the sixteenth century both Spanish and Portuguese ships used Bermuda as a place for replenishment of fresh meat and water, while the dangerous reefs and perpetual storm-wrecked conditions kept them from building a permanent settlement on the island. Bermuda’s waters are known for its maze of reefs that can damage ships that dare to venture too close. The wreckage of many ships still dot the outer reefs. Early seamen named Bermuda the ‘Isle of Devils’ after hearing the howls of hogs and strange cries from its native birds, the Cahow’s, that inhabited the island. The ship’s crew were convinced that the tiny island was possessed by demons and spirits. This north of the Caribbean, Island of Bermuda takes its name from a Spaniard, called Juan de Bermudez, who came to the island in 1503. But the island continued to be uninhabited, despite the repeated visits by the Spanish, Portuguese and English ships, until almost a century later. A hurricane in 1609 blew the British ship ‘The Sea Venture’ onto the reefs here. As they salvaged what they could, the survivors formed the first settlement. The Sea Venture, commanded by Admiral Sir George Somers, was on her way to the then New World settlement at Jamestown, Virginia, with new settlers and supplies. This is also the reason why the Island of Bermuda is also called the Isle of Somers. 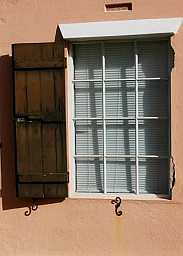 Even though most of the settlers continued towards their original destination in a ship that they built while stranded on Bermuda, some stayed and there have been people living on the island since then. This incident also served to establish Bermuda’s British colony status. In the early twentieth century, modern transport and communication systems developed and Bermuda became popular as a destination for wealthy American, Canadian and British vacationers, Caribbean and island real estate investors. Since then, Bermuda has significantly developed its tourism industry – it is second only to international business conducted on the island. 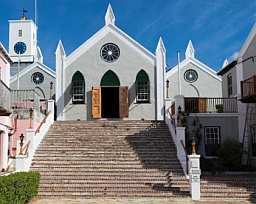 The culture of Bermuda is a mix of British and African heritages. British influences are most discernible in institutions like the government, while African heritage is a lot more subtle and evident in the music and dance forms on the island. A large part of African-oriented music has arrived in Bermuda via the West Indies, including styles like reggae and calypso. The African influence is very evident in the Gombey dancers. This is a unique art form, indigenous to the Bermuda islands with roots in West African tribal music. It has also come to incorporate all the varied influences from Christian missionaries and the British military to the American Indians. The Gombey dancers’ costumes are adapted from ceremonial American Indian dresses. The dancing is choreographed very carefully, with specific rhythms and drumbeats and usually enacts stories from the bible. The dancers usually perform on Boxing Day and New Year’s Day. Bermuda does not really have a distinctly different cuisine, but there are, of course, some local seafood dishes that are quite unique and worth mentioning. Fish chowder and Codfish cakes are as well known as ‘Johnny’ cakes, famous in songs as cornmeal griddle cakes. Peas and rice are popular parts of the staple food in the Caribbean Island nations as well as Bermuda. The most important and traditional meal is the Sunday codfish breakfast. This is usually a large meal of codfish that also includes eggs, boiled Irish potatoes and bananas, accompanied by avocado, as well as an onion and tomato sauce.